What Does a Parks Manager Do? 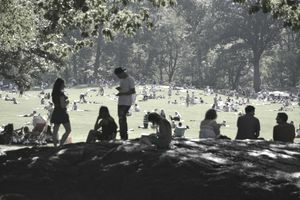 Parks are public spaces with or without additional facilities designed to be used by members of the public. Anything from a small neighborhood park to Yellowstone National Park qualifies as a park. Parks managers oversee the maintenance and operations of these parks. Not only do parks vary greatly in size, but they also vary in the governments that administer them. Parks managers are employed at all levels of government. The National Parks Service within the US Department of the Interior runs national parks. The individual in charge of a national park is called the superintendent; however, this article primarily focuses on parks managers at the state and local levels. Parks managers are selected through the normal government hiring process; however, hiring managers often involve other people in the process. In cities, other department heads or parks and recreation commission members may sit in on panel interviews. Using panel interviews helps the director gather other people’s perspectives on the interviewed finalists. Hiring decisions are too important to make in a vacuum, so prudent managers gather outside perspectives during the process. Parks managers need a bachelor’s degree in one of the natural sciences, leisure studies, landscape architecture or a similar field. Those candidates with related experience can get a parks manager job with an unrelated bachelor’s degree. In certain parts of the country, being bilingual in English and Spanish is very helpful because some of the maintenance staff may not speak English. It is incredibly challenging to supervise someone who does not speak your language. Conversely, it is challenging for such an employee as well. A parks manager should have considerable experience working with public parks or landscape architecture. Supervisory experience is highly beneficial for parks managers at all levels of government. Parks managers oversee the maintenance and operations of public parks. They do this through supervising a staff who may include park rangers, landscapers, ecologists, arborists, and other similar employees. Maintenance includes cutting grass, trimming trees, applying fertilizer and pesticides, inspecting equipment, cleaning restrooms and performing other related tasks. The parks manager sets out schedules for these activities to be done and holds staff accountable for executing the necessary tasks within specified timeframes and up to acceptable quality. Maintenance activities have two purposes. First, they keep the parks looking nice. Second, enhance the parks’ safety. For example, maintenance workers regularly cut the grass in urban parks to keep them looking nice and to keep snakes and rodents away. Small parks do not require operational duties. The parks and recreation department does not maintain a staff presence during a small park’s open hours. However, larger parks with designated entrances and mandatory fees require staff to monitor access, collect fees and respond to emergencies that happen within the park. Parks managers assist their superiors in developing budgets. Parks require regular spending for maintenance staff and supplies and capital expenditures for big-ticket items and substantial improvements. When budgets are tight, the parks manager may be asked to prioritize maintenance activities and possibly forego some of the activities that make parks look nice but do not necessarily enhance safety. The work of a parks manager happens both in an office environment and in the parks themselves. Administrative tasks can be done from the office. Management tasks that are not purely administrative—such as verifying that maintenance tasks are completed or counseling an employee about poor performance—often happen in the parks. Many cities put maintenance of city buildings and cemeteries under the parks manager. It makes sense organizationally because the parks manager’s staff maintain similar city properties. Along with the parks and recreation director, the parks manager creates and periodically updates a city’s parks plan. This plan projects when major additions and improvements will be made to the city’s parks system. When city parks are under construction or undergo major renovations, the parks manager works with the public works director and other public works staff to make sure the construction or renovation goes according to plan. The parks manager often interacts with the recreation manager because the recreation manager’s programs often rely on parks as settings for the programs. For example, a city softball league needs city softball fields to hold practices and games. The recreation manager reports to the parks and recreation director like the parks manager does. Since parks managers are employed at all levels of government around the country, pinning down an average salary is problematic. Fortunately, government job postings almost always have a salary range attached to them. For individuals looking for employment in cities, researching salaries of parks and recreation directors in the geographical area can be helpful. Parks managers make a little less than their director-level bosses.